The Chicco Baby Hug 4 in 1 is designed to cover all your baby's sleeping and resting needs. 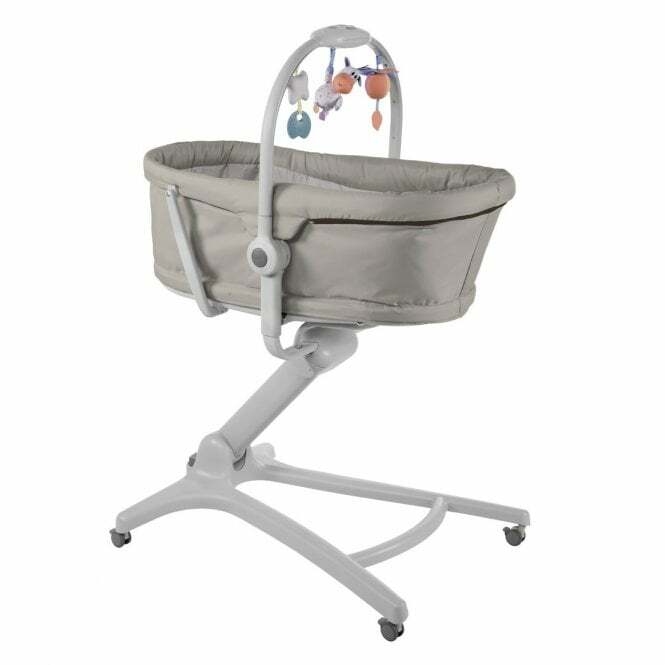 It is a comfortable overnight crib, a recliner from birth the from 6 months it can be used as a convenient highchair and a first chair for the table. Why should I choose the Chicco Baby Hug 4 in 1? The unique Chicco Baby Hug 4 in 1 is the perfect night time crib. It is so versatile that it also allows you to look after your baby's needs whilst giving you the freedom to manage what you have to do during the day. Designed to cover your baby's sleeping and resting needs, from birth the Hug 4 in 1 is a comfortable overnight crib and recliner. Then from 6 months the Baby Hug 4 in 1 is a convenient highchair and a first chair for use at the dining table. There is minimum fuss with this versatile model. By simply pressing the pedal you can choose the perfect height to suit you. The four wheels, each with a separate brake, make it easy to move from room to room, not just the nursery, and position the Baby Hug so that your baby can go everywhere with you. When reclined, the Chicco Baby Hug 4 in 1 can be used from birth thanks to the soft, washable and removable insert. Then from 6 months, it can easily be attached to tables of all heights so the smallest member can join in on all family meals. What are the specifications of the Chicco Baby Hug 4 in 1? Do I get a warranty with the Baby Hug 4 in 1? Yes, you get a manufacturer's two year warranty, covering manufacturing faults. Valid in the UK and Ireland only.